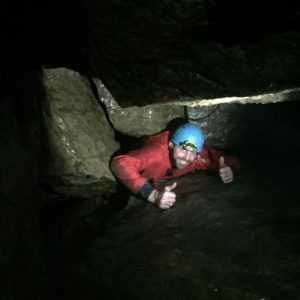 Our Caving trips and experiences are available across Nidderdale AONB, The Yorkshire Dales & The Peak District as full or half day caving adventures. 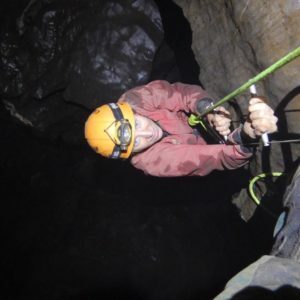 Nidderdale boasts a large varied cave network in which we can offer a trips for everyone. 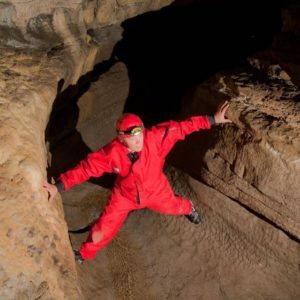 The area has many caving locations, experiences & venues and is where we operate many of our trips. Our base How Stean Gorge is just round the corner and you can access all our facilities, changing rooms and extensive stores before or after your experience. 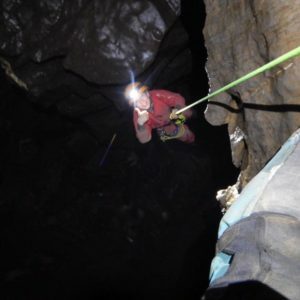 Whether you are on your first trip underground or keen for an adventure to push you to your limits by venturing further and deeper on a vertical abseiling trip. 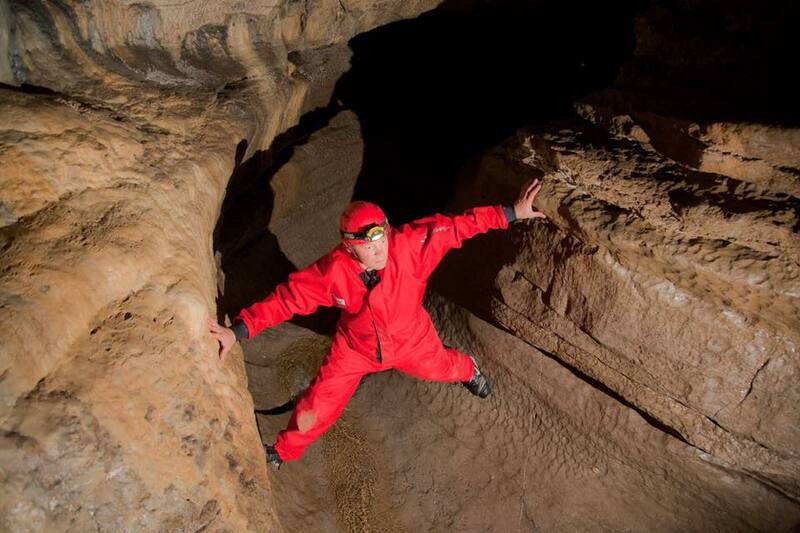 The Nidderdale cave system is a network of 12km interweaving passage ways that can be linked to tailor a trip to your needs. Manchester Hole is the first cave on the system as this is where the river disappears underground to begin its journey; leaving and dry river bed which only flows in period of wet weather. Manchester Hot starts with climbing over boulders to access the stream way. From here you walk down a large passage stream way which is lined with calcite features which leads to mud hall. From here you have two options you can head up and climb over the mud bank viewing some straw and stalactite formations in the roof and then regain the stream way on the other side or, you can head down the stream way climbing in and around boulders which gets tighter as you go. After about 50m you will be able to stand up again and continue walking. From here you can continue downstream through ‘Fossil Wall’ passage which is lined with brachiopod fossils to head out of Bax pot which good for the more adventurous groups as it involves crawling through the stream way or you can turn around and come out the same route. 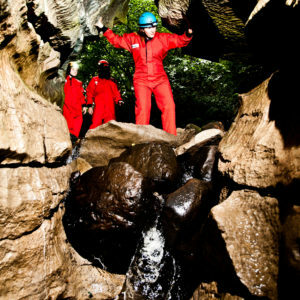 Goyden pot is the largest cave in Nidderdale and is connected to Manchester Hole via the stream way. This large network of tunnels twists and interlocks which itself, offering a variety of different routes depending on the group’s want and needs. 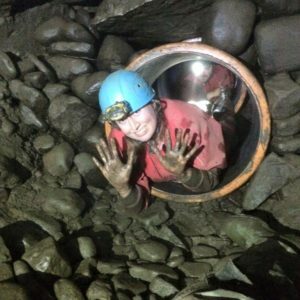 There is something for everyone whether it is abseiling down underground cliffs, crawling through small spaces, or walking down the massive main chamber and streamway looking at the fossils in the rocks and learning picking how the cave was formed. A great starter trip in goydon pot would be the “round Trip” this involves a base trip of about 400m. I know this doesn’t sound like much but when you are riggerling around on your tummy or climbing up mud banks this 400m can soon tyre you out. From this trip extra passage ways can be bolted on to create more challenging obstacles being climbs or tighter squeezes. New Goyden is for those that want an arm work out. This cave boasts a spectacular Planetarium and has many passages to explore. To gain access to this cave you must first squeeze through a opening in the dry river bed which can only be found by the people in the know. This leads to the top of the first “pitch” in which you will need to abseil down the 15m to the top of the second pitch. This second pitch is another 14m free hanging abseil into the spectacular stream passage below. From here you head off from have an explore and return back up the pitches via a “rope” ladder. 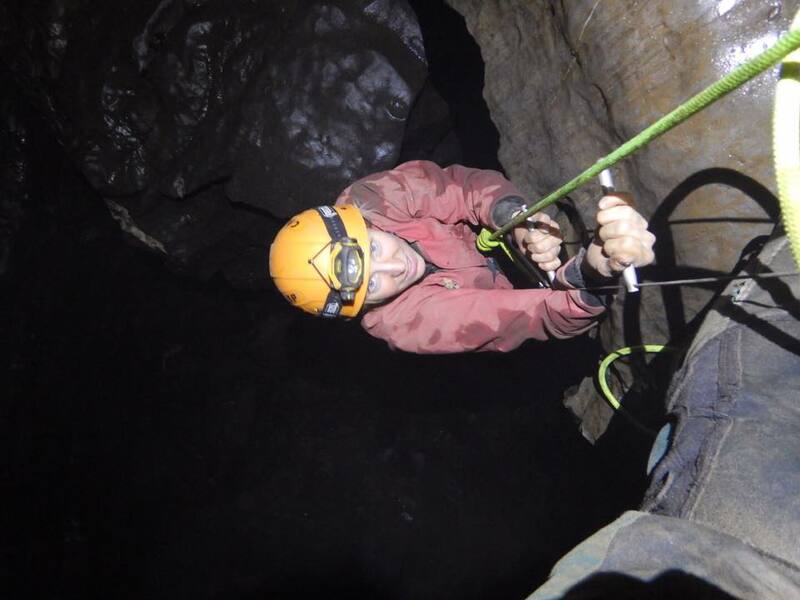 The Kingsdale valley is very short drive from Ingleton, Yorkshire and hosts a number of amazing Caving experiences and opportunities. 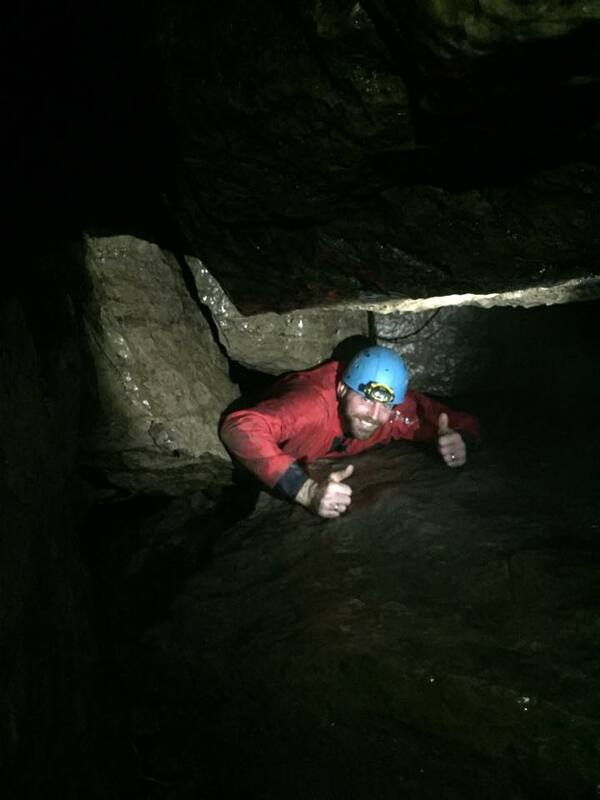 These caves are two of the classic “pull through” trips in the Yorkshire Dales. They both follow active stream ways and involve multiple abseils eventually emerging out through the Kingsdale Master system. To start with you will walk up to the top entrance of your chosen cave and from there it is down, down, down! The nature of these trips means that there is very little climbing to do. 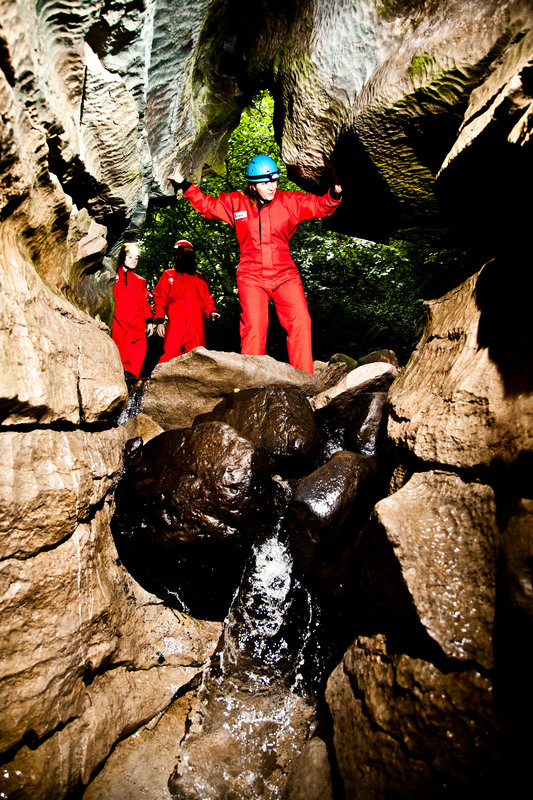 Prepare yourself for wet crawls, rope work and the feeling of exposure on some big abseils! A pull through trip is 100% committing. After each abseil you pull the rope down and use it to rig the next abseil. This means there is no way you can retrace your steps and your only way out is to complete the trip. Both are excellent and exciting trips with a definite sense of achievement when you exit at Valley Entrance. Long Churn is a short walk up the hill from Selside. It is a network of wet and dry passages and trips can be tailored to suit your party. Most of the passages are walkable with water of various depths along the way. However, some passages involve crawling and squeezing but these can be avoided if needs be. If you are feeling adventurous then you might choose to try the famous Cheese Press or climb up Dr Bannister’s which is an underground waterfall! 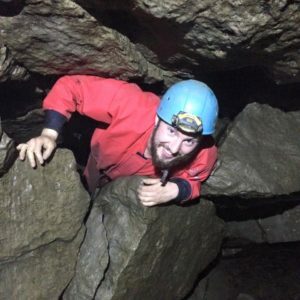 This trip is a great introduction to the sport of Caving and if you are looking for a fun day out this is the trip for you. Sell Gill is a challenging trip near Horton in Ribblesdale. The aim of the trip is to see the impressively big chamber at the bottom and the underground waterfall which tumbles down from the Goblin Entrance. To get to the bottom there are a series of three pitches to negotiate, the highest one being 15m. 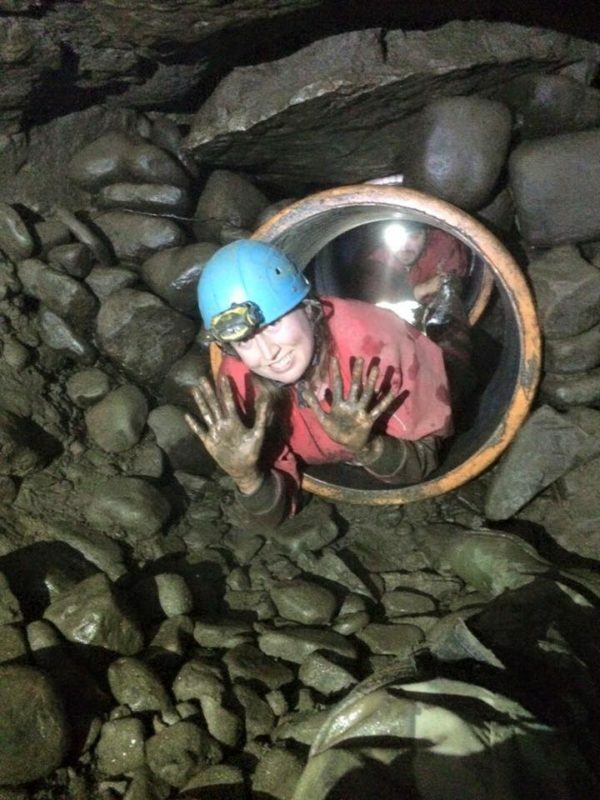 Once you have explored the chamber the challenge really starts! 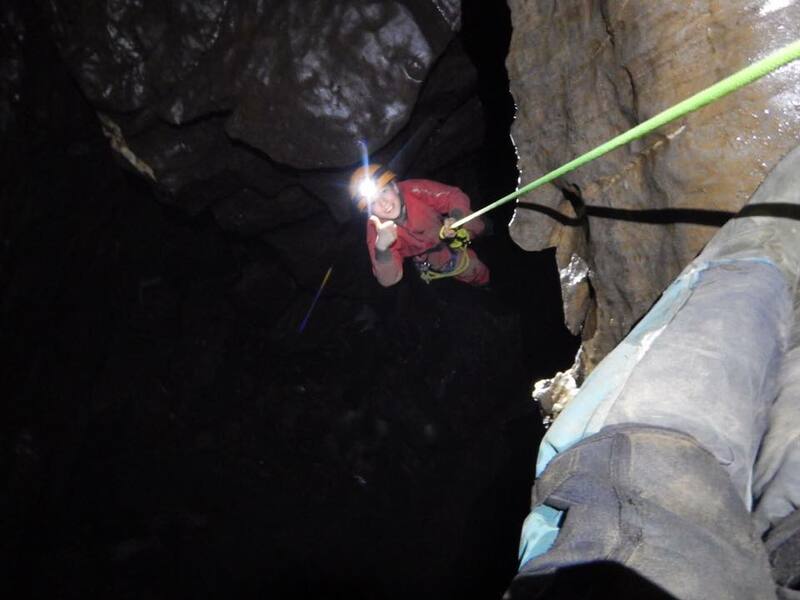 You need to climb back up the pitches using wire ladders, this is the only way back to the surface.